I have been spending more and more time shooting outside Thailand, ( primarily Burma and Cambodia) hence reason my posts sorta dried up. When will you all start a thread for OUTSIDE Thailand??? We have this thread: "World Wide" ..... is that not good enough? nope. was hoping for one se asia related. Perhaps not a bad idea for some discussion PR.... The way we have always looked at TVF it is about "Life in Thailand"... which we've tried to keep...that way. We should have a thread for neighbouring countries ? It puts me in a little bit of a spot here,/ conflict as I am off the KL tomorrow, then Yangon for a few weeks after that... In the past I have limited my previous travel photos to being posted in world wide.. but I see your point! I am all for your suggestion, I think it is a very good idea and would support it. I don't think your comment about Aladdin is warranted and have deleted that comment. Aladdin has been a very good contributor to the forum and appears to be upset about the comment. So when you put a copyright on your photo, do you have a written permission from this person to use it? A thread will be opened In the next hour or so. This thread has been started and your image " Chin State, Burma " has been copied over to it. I do like nice sharp photos. The title is a bit confusing at first as I thought only her chin was tattooed, then when I saw the photo knew immediately that it referred to a woman from the Chin ethnic people of Burma. But then my cheeky nature took over and I thought it would have been a nice shot if she was also sitting on her chopper, whether it was a Harley or not. 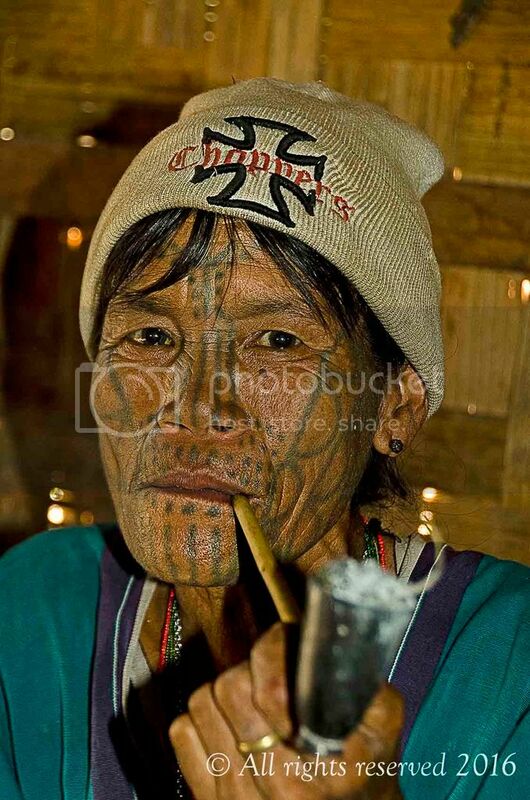 As many of my own shots are from Laos I do applaud the new category too. A shame you had to use flash, the heavy shadow detracts somewhat from a very interesting face. Not so much the shadow for me, but the out of focus pipe.